Dr. Thomas completed medical school at Kasturba Medical College in India. She completed her residency program at the University of Pittsburgh Medical Center- Mckeesport Hospital in Pennsylvania. She was awarded Intern of the Year and Resident Researcher of the Year. She attended the University of Maryland where she completed her fellowship in Hematology and Medical Oncology. Dr. Thomas is board certified in Medical Oncology and Internal Medicine in 2001. She has served on cancer committees and tumor boards and lectured for Grand Round conferences in hospitals in prior practices. 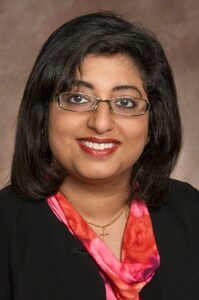 She is a member of the American Society of Clinical Oncology and Indo-American Cancer Association. She specializes in the diagnosis and treatment of all cancers with a special interest in gynecological, breast, lung and gastrointestinal cancers.